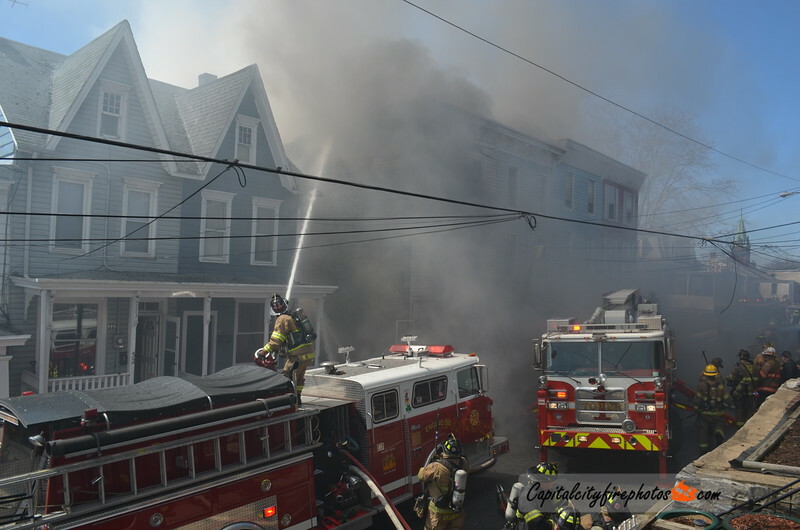 At 1246 hours Box 501 sent companies to the first block of S. 3rd Street in the Borough of Steelton for a structure fire. Engine 50 (Steelton) arrived on location with smoke showing from an occupied, 3 story, end of the row, dwelling and laid a line in from S. 3rd and Walnut Streets. Tower 1 (Harrisburg) arrived and nosed in to Engine 50 on side A. Command 50 requested the first alarm assignment and shortly followed with a second alarm. First arriving crews stretched a line into the front door of 28 S. 3rd Street to initiate an interior attack and perform a primary search. The fire building was a row of four, 3 story, wood frame, dwellings that were built on a hillside and with limited access in the rear. A basement fire quickly travelled to the upper floors and forced interior crews to evacuate the structure. Companies went in service with 2.5” inch lines and the deck gun from Engine 50 as heavy smoke blanketed the scene. The fire extended to the exposure on the D side. The remaining homes suffered smoke damage. Companies also worked in the exposure on the A Side, a non-attached, frame dwelling, to keep fire from entering that structure. The rear of the fire building collapsed and exterior operations continued on the fire building and exposure. The fire was placed under control in about 2 hours. All residents accounted for and no injuries reported. Seven adults and 4 children were left homeless.